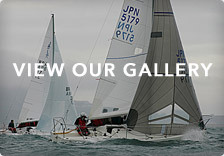 The first J/24 regatta of the season was hosted by Fowey Gallants SC over the last weekend in April and following this I think I can speak for the majority that 2013 is set to be an exciting season. Much of the Plymouth fleet arrived by sea early Friday evening whilst boats travelling from further afield had launched at Penmarlam Quay during the day with several boats heading out for a shake-down sail during the day. We welcomed two new/returning boat crews, Illuminator and Team Redrow, into the fleet to boost the numbers and provide even greater competition. Day one of racing followed a race briefing in the Fowey Gallants with Race Officer Peter Morgan setting a Windward-Leeward course with the start line approximately 1 mile SW of the estuary entrance. With the majority of the fleet sailing under jibs in the gusty north-westerly breeze, leading to flat water yet shifty conditions and giving challenging tactical decisions for all crews as to which side of the beat to take and how to best judge the ebbing tide. 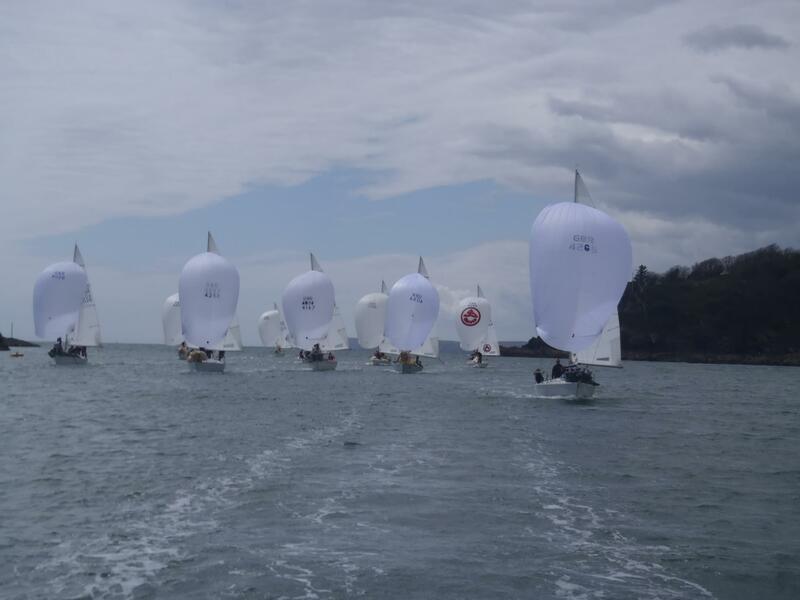 This led to several boats making too early a call on the Windward mark, including the Jiggy2 crew requiring some slick pirouettes between the windward and spreader mark. Each race was around 40 minutes duration with a swift turnaround between races. Each leg and mark rounding proved testing as inevitably, over the short race course, traffic became congested at times and, certainly on our boat, we were feeling the strain by race 5 in terms of depleted energy levels. Race wins for day one: Race 1: Jawbreaker, Race 2: Madeleine, Race 3 and 4 Hitchhiker and Race 5 Jiggy2. The state of play at the end of the day saw Madeleine and Hitchhiker within 3 points of each other for the lead followed by a tight pack all within 1 point of each other. Whilst crews kicked back in the evening sunshine on the terrace of Fowey Gallants, discussing the day & enjoying a pint of Tribute courtesy of event sponsor St Austell Brewery, Alan Harris of Sail Shape Ltd got to work mending a ripped spinnaker and ensuring all boats were ready for the following day. 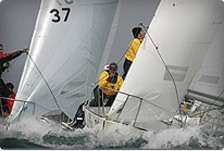 Sunday brought contrasting sailing conditions. Crews arrived down to their boats early to ease off rig tension and set up for somewhat more tranquil conditions. The wind gradually filled in to a steady 10knts from SW with all crews sailing under genoas. The start-line throughout the weekend was highly competitive with helms vying for best position. The PRO black flagged Races 4, 7 & 8 with 5 boats paying the price of being on the wrong side of the line. To accompany the fleet we had a dolphin to escorting us around the course, seeming to have a particular fondness to local team Jumba. Race wins for Day 2: Race 6: Jiggy2, Race 7: Madeleine, Race 8: Hitchhiker.